We went to work today and build a fireplace & chimney to tent. The day has been warm and pleasant. The first half of November 1864 was a time of watching and waiting. In the north, Grant and Lee had mostly settled into winter quarters. West of the Mississippi, minor skirmishes continued but nothing much new took place. Then the second shoe dropped in Tennessee and Georgia. Forrest’s audacious calvary attack, early in November, on the Union supply depot at Johnsonville, Tennessee, presaged the Confederacy’s plans to divert Sherman from his Georgia campaign, but Sherman felt confident that Thomas could deal with the situation from Nashville. And Hood did his part leaving the initiative, waiting for three weeks at Tuscumbia, Alabama, for Forrest’s cavalry. 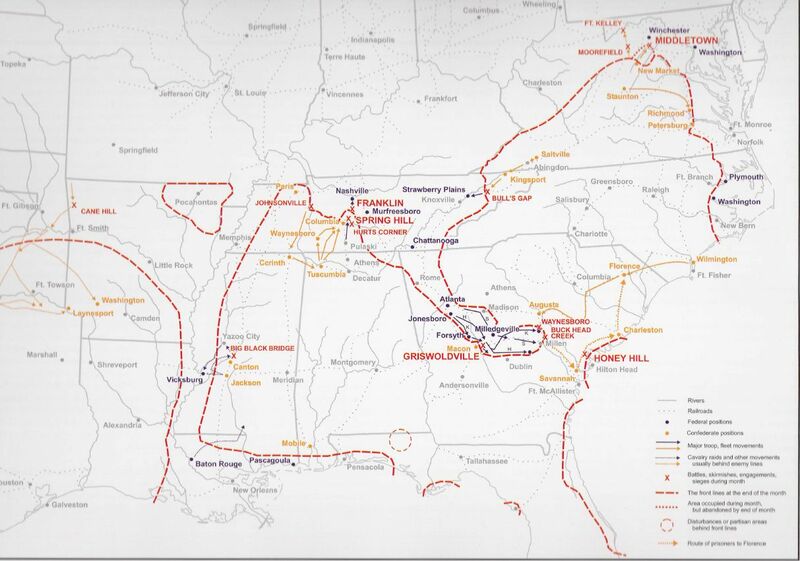 On 13 November, Hood moved his headquarters across the Tennessee River to Florence, Alabama, with two corp and the army’s supply train crossing on 14-15 November. Hood started marching north on the 21st in three columns with Forrest’s cavalry screening their movements. Union cavalry were outmatched and had difficulty tracking the Confederate troops. Forrest met Maj Gen James H. Wilson’s calvary at Columbia, Tennessee, and skirmished for several days, 24-28 November, while the Confederate corps marched north. On the 28th, after Forrest skirted the town to the southeast, Maj Gen John Schofield withdrew his XXIII Corp and Maj Gen David S. Stanley’s IV Corp north to Franklin. The next day, 12,000 Confederate troops engaged 7,000 Federal troops at Spring Hill, Tennessee, to no avail due to miscommunication and missed opportunities no the part of the Southern Command. This permitted Schofield’s retreat and retrenchment up the road at Franklin, Tennessee, on 30 November. 52,000 men were arrayed, evenly split by each army, yet at the end of the day lay 6,2252 Confederate casualties vs. just 2,326 for the Union troops. Over the midnight hour, Schofield began to move his infantry again further north to Nashville, denying Hood the opportunity to engage in open country. That the Federals did do, later in December after they had healed up and Hood had drawn down his supplies. And of course, in Georgia, well, we’re following that campaign in real time (+150 years). This entry was posted in Pursuit of Happiness and tagged Civil War, GA, history, jcshepard.com, Orrin Brown, TN. Bookmark the permalink.